How do I calculate the shipping costs for my order? Can I pay with a wire? How do I go about returning a purchase? Rechargeable Battery Information and Care - Getting the most from your batteries! Does Battery Junction Collect Sales Tax? Yes, we accept checks and money orders. 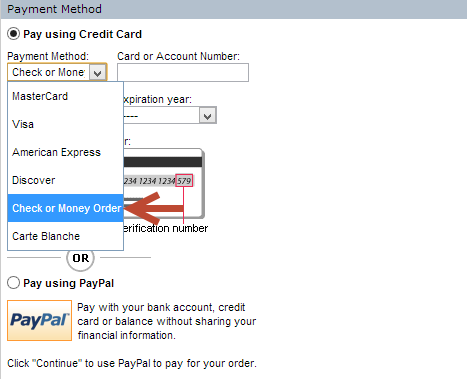 To pay with a check or money order please enter your order directly on the website. Review your order on the next screen and then select PLACE ORDER. Your order is now placed and you're on the Order Confirmation screen. On this page you will find the address to mail your check or money order to. Please be sure to print out and enclose a copy of the Confirmation Page or order confirmation email with your check or money order. Wire payments are only accepted for orders over $500. For orders between $500 and $1500 there is a $35 bank fee which must be added to the wire payment. For orders over $1500 we will waive the bank fee. Please contact us in advance of placing an order if you intend to pay via wire. We make every effort to keep item availability information current so please be sure to see the 'Availability' field just above the item price on our item listings. Most orders ship in 1-2 business days and we will notify you as soon as possible if there will be any delay longer than 4 days. Pre-Orders and Backorders will be charged at the time the order is placed. We will ship your order as soon as possible and will send a shipment confirmation when the order ships. At our discretion we may ship in-stock items immediately and back-ordered items as they arrive; if this is done at our discretion there will be no additional shipping charges. Browse or search for an item you want to buy. Once you've selected your gift, click on checkout. On the Shipping Form, you'll see a field that says "Enter the Coupon or Gift Certificate Code." Make sure that you enter the complete gift certificate code and hit Apply. Valid gift certificate codes start with the "@" sign. If you have more than one gift certificate, you can enter all of the codes separated by commas. If you have enough funds on the gift certificate to cover the cost of your order you won't be required to enter any payment information. Please check your package to verify that you have received everything you ordered. We eagerly want to resolve any discrepancies that may have taken place. Please check for any missing items, items damaged in transit, defective items or wrong sizes/colors. We must be notified of any order discrepancies within 7 days of the date of delivery. Any notification of a discrepancy more than 7 days from the date of delivery will not be considered. If an item does not meet with your satisfaction for any reason, you are welcome to return it. You must obtain an RMA. You must notify us of your desire to return your purchase within 7 days and it must be returned within 15 days of issuance of an RMA. Returned items must be the same item in the same condition as originally shipped; products which have been modified, welded or soldered are not eligible for return. Returns should be shipped insured. Refunds are for the final purchase price only, less a 15% restocking fee. Shipping costs, insurance, and handling charges (if any) are non-refundable. Special orders are not returnable. A credit will be issued as soon as we receive and process your return. Please allow up to two billing cycles for a refund to appear on your credit card statement. If the item you have ordered is defective, contact us within the seller warranty period of 30 days and we will replace the defective item for you with an item of equal or greater functionality. For returns of Open Box or used items, we will issue a credit after receiving and processing your return. We generally are unable to offer replacements for open box items. We do not pay for return shipping but will pay shipping on the replacement item for domestic orders. International buyers pay shipping both ways. Outside of 30 days only manufacturers warranties (if any) apply. If you return for a refund any items that were originally delivered to you under the terms of a free standard shipping offer then we will deduct from your refund our fee for Ground delivery. You must obtain a Return Merchandise Authorization ("RMA") number within the applicable Return Policy period. BatteryJunction.com will not accept returns without prior authorization and an RMA number. Once issued, RMA numbers are valid for 15 days. BatteryJunction.com must receive the returned products within this timeframe. RMA numbers will not be extended or reissued. Customer should prominently display the RMA number(s) on the shipping label of boxes containing the returned product. Return RMA Request - please be sure to reference your order number. If this is not possible, please provide your last name AND zip code. When and why are restocking fees applied? There is a restocking fee of 15% on all returns for refund (RMA Refund), unless waived by a Customer Support Agent. We charge this 15% restocking fee for all returns for refund to encourage customers to purchase products they intend to keep. We offer RMA Replacement (exchanges) without any restocking fee to support customers who have received a defective product. Does BatteryJunction.com pay the return shipping cost for defective merchandise? No, BatteryJunction.com does not pay the return shipping cost for defective merchandise. We are not responsible for product defects, because we do not manufacture the products we carry. However, if you pay to send the item back to BatteryJunction.com, we will replace the item and ship the replacement to you at no charge. BatteryJunction.com will employ every resource it has to ensure that your item is replaced promptly, without hassle. BatteryJunction.com does not cross-ship any items. If you do have a defective item, and it is eligible for a refund or exchange, you can get an RMA for a refund or exchange on that item. Separate from that, you can re-order the item on the website. You will receive the refund for the defective item once we process the RMA. How long does it take for BatteryJunction.com to process an RMA? UPC code along with retail package if received with such. No guarantee of suitability or fitness for a particular purpose is given. All products sold by BATTERYJUNCTION.COM are NEW, Class A merchandise unless specifically noted to the contrary in the item description. All items delivered by BATTERYJUNCTION.COM are warranted as follows: 30 days limited warranty. This warranty does not cover any damages due to accidents, misuse or negligence. This warranty is limited to the value of goods sold and does not cover any associated damages. BATTERYJUNCTION.COM makes no further warranties unless specified in writing between the parties on this document. BATTERYJUNCTION.COM, its parent company and subsidiaries, shall not be held liable for any special, consequential, incidental or other damages to the product, including but not limited to, damages for loss of profits, loss of use or any damages or sums paid by buyer to third parties. By buying from BATTERYJUNCTION.COM, you are accepting the terms listed herein including all conditions and returns policies. Orders placed in the state of Connecticut are subject to a 6.35% state sales tax. Battery Junction is dedicated to enhancing accessibility, diversity and inclusion. We believe all of our guests should be able to easily shop online and access all of our digital offerings. We follow W3C's globally recognized standards to provide content that is compatible with computer-based assistive technologies and browsers. We recommend using the most current versions of (or the version released just prior to) the manufacturer's assistive technology applications, along with a current version of the web browser. We also recommend trying different types of browsers with assistive technology applications to determine which combination works best for you. Additionally, we support screen magnification technologies and accessibility features � like zoom, color and other image controls � that major browsers provide. We don't provide assistive technology applications or browsers. Please visit the individual manufacturer's site for information about how to obtain them. You may also have access to assistance from local and state agencies or non-profit groups in your area. Potentially Fraudulent Orders: Orders that fail to pass our fraud screening process will be cancelled. Incorrect Pricing: Orders that contain incorrect or erroneous pricing will be cancelled and refunded.